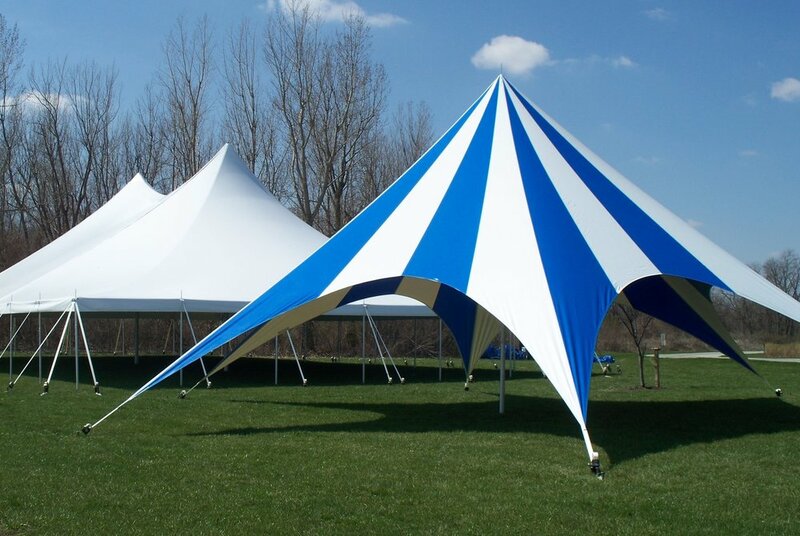 TP Series Tents are 52’ diameter, single-pole tents with six large entry points around the tent perimeter. Each tent is secured with box ratchet assemblies attached to the ends of the open arches, which are staked in place. 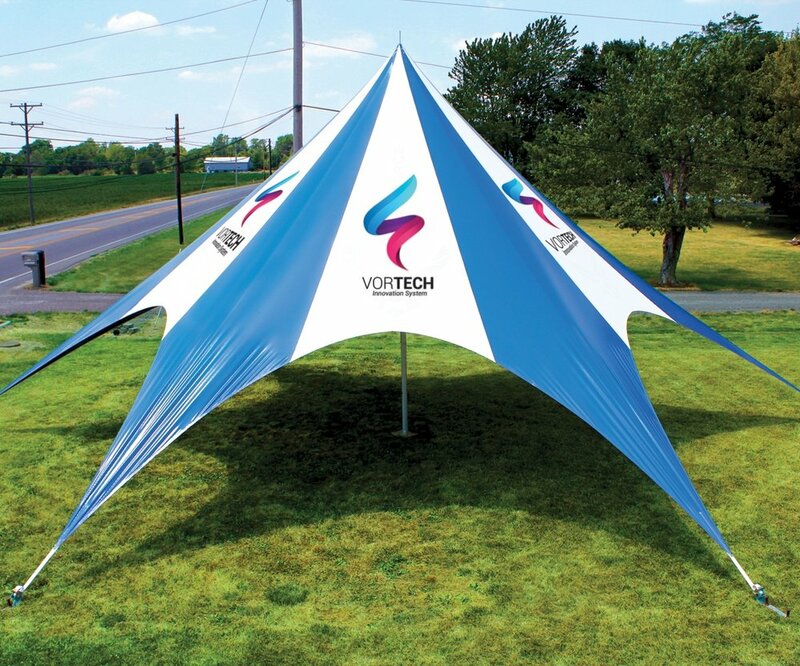 When customized with printing, each of the arch sections of the TP Series Tent can be designed as a complete repeating unit. Sections have a pair of manufacturing seams to be aware of when creating the complete design. The artwork template can be found here for setting up your imagery. 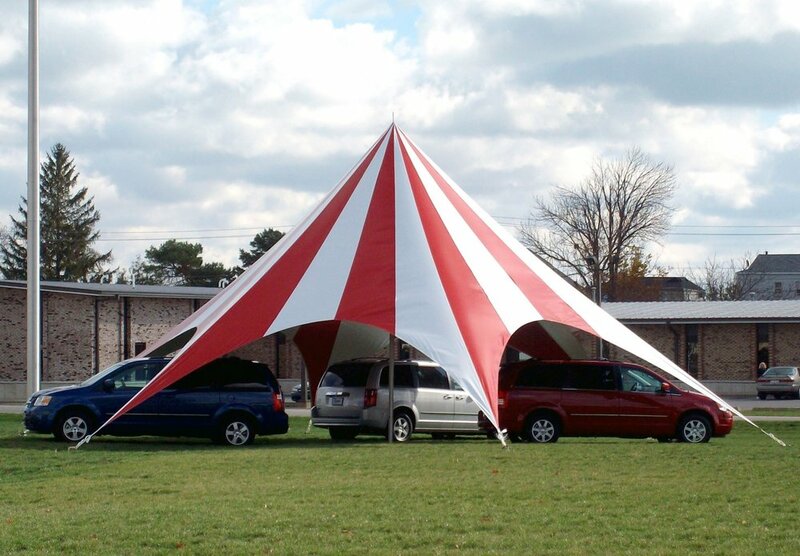 Installing a standard TP Series Tent requires measuring and staking from the proposed center placement for the tent. After laying out a drop cloth, the fabric is laid out and connected to the stakes before the center pole is installed. The guy lines apply tension through the box ratchets that are staked in place. Watch installations, time lapses, and other informational videos here. The openings on the TP Series Tent are large enough for cars to drive through with a total height of 8 feet 5 inches (2.6 m). TP installations are great for central hub areas at events, with large openings around the tent perimeter in all directions. Hardware for TP Series Tents includes two stakes for each box ratchet location; gang staking improves each location’s holding power.